BelarusDigest > All > Will there Be a Single Opposition Candidate in 2015 Elections? Will there Be a Single Opposition Candidate in 2015 Elections? Last week Mikalai Statkievich, a former presidential candidate, stated from prison that the Belarusian opposition needs to choose a single candidate for the presidential election from a pool of people with serious politically-motivated convictions. His comments come ahead of Belarus's next presidential election in autumn 2015. Statkevich has de facto suggested boycotting the elections and organising protests before the election day. Other politicians have heard about the prisoner’s proposal, but are not giving his words much consideration. Already seven opposition figures have announced that they may participate in the upcoming election and are now working on the details a Congress that will choose a single candidate. However, the opposition may return to Statkievich’s idea if they fail to work out a way to nominate delegates to the congress. Such a strategy from the opposition will help it exhibit its moral stance, but may further marginalise it. On 19 August, Statkevich's web-site published the former presidential candidate's vision for the 2015 election season. The political prisoner insists on the need to select a single candidate to run for office. He says that an opposition leader should have serious political commitments and may even be someone who is currently in prison. 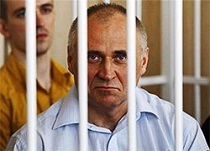 However, because the Belarusian Constitution prohibits candidates with a criminal record from participating in the presidential elections, the authorities will refuse to register a candidate with a prison record. According to Statkevich, if this will be the case, the opposition can simply just begin to protest and boycott the elections. The former presidential candidate believes that the Belarusian opposition should firstly obtain a moral victory and then inflict political, international and moral damage to Lukashenka’s regime. Although some publicly supported Statkevich’s proposal, few actually share his views on the issue. The majority feel that Statkievich's own nomination should be considered only if the Belarusian opposition is unable to agree on the nomination of another single candidate. Currently, several opposition leaders have already expressed their desire to challenge Lukashenka next year. Anatol Liabiedzka, leader of the United Civil Party, remains one of the old-timers of the Belarusian opposition. The congress of his party choose him as a potential presidential candidate on 31 May 2014. He seems to be the best opposition speaker, but he has been in politics ​throughout the life – something which may turn out to be his weak spot. Valery Fralou, a retired General and deputy chairman of the Belarusian Social Democratic Party (Hramada), has a solid resume, but lacks a team that would promote his candidacy. He announced that we would like to participate in the presidential elections in June 2014. Several other people have also stated that they do not exclude the possibility of their participation in the presidential campaign. Aliaksandr Lahviniec​ is Milinkevich’s deputy and perhaps the younger generation Milinkevich is speaking about. Lahviniec has taught for a long time in Europe and the United States, and worked in the European Parliament. On 4 August he said that he may become a candidate, but his nomination should be based on a decision reached together between several political forces. Volha ​ Karach, head of the Our House initiative, has become one of the most outstanding personalities in the Belarusian politics in recent years. She said to the Narodnaja Volia newspaper that she will run "if Belarusians will support her". Karach has tense relations with other members of the opposition, so she is unlikely to unite Belarusian pro-democracy forces. Statkievich’s strategy is rooted in a desire to change the rules of the game in Belarusian politics. For a long time, the opposition has been unable to win any meaningful elections, elections that were plagued by government orchestrated falsifications and fraud. One of its biggest challenges lies in getting its message out, since they do not have access to large media outlets to spread their message. Representatives of civil society and the political opposition often say that they live in a ghetto. To get out of the ghetto, the political prisoner offers to appeal to society's moral conscience, but does not direct their efforts towards society's actual needs. In pursuing Statkievich's proposal, the Belarusian oppositions risks becoming even more marginalised in society. If opposition candidates lose the ability to use state media for campaigning during the elections, pro-democracy forces will fail to reach most of Belarusians. Counting on large scale protests may also be a recipe for disaster since most Belarusians, like a majority of opposition politicians, remain intimidated, and law enforcement agencies are more than ready to violently suppress any protests. Thus, rather than achieving a moral victory, the opposition may become more even less visible. It is no secret that by running a single candidate, groups have significantly improved chances of running a successful campaign. A single candidate can gain the support of all of the pro-democracy electorate and the West. Through them, all of the institutional and financial resources of the opposition can be used towards their campaign. When Milinkevich ran as a single candidate in 2006 he became the most popular opposition politician in the country in just six months. In 2010, the opposition fielded eight candidates, and thus demonstrated to Belarusians that pro-democracy forces in the country cannot find common ground even among themselves. Although the Belarusian opposition has started discussing the 2015 presidential election last year, their progress remains modest at best. So far, the main opposition figures have reached an agreement on the conduct of the Congress, but the mechanism for electing delegates to the Congress remains obscure. The result of the vote will depend on the mechanism for nominating delegates, so the opposition will certainly spend a few months working out the details before anything is established. It remains possible that the opposition will fail to resolve the issue at all. Therefore, many in the opposition say that it may be better for pro-democracy forces to devote their time to society, not to congresses. Then again, a union may naturally be formed as no political movement in Belarus is self-sufficient and will be forced to look for allies in order to thrive. Right now it would be better for the Belarusian opposition to discuss their ideas in public. Privately, all politicians complain about each other missing deadlines, pushing poorly conceived proposals, or saying one thing in media while doing another in real life. If the talks were held in public, the public would be able to determine for themselves who fails to keep their word. Otherwise, Belarus' pro-democracy forces should heed Statkievich’s suggestion. If the opposition is not ready to be politicians, then maybe the time to be dissidents has come. In 2013, only 2,200 Ukrainians made their way to Belarus to live, according to the official statistics. Earlier, on 6 September Aliaksandr Lukashenka in an interview to Russia 1 TV channel said that around 3,000 Ukrainians want to stay in Belarus and had applied for a refugee status. In June, Lukashenka publicly admitted that Belarus welcomes people from Ukraine and will provide them with jobs and shelter. To meet the needs of migrants, he signed a special decree to legally facilitate their integration into society. Now, Belarus indeed offers plenty of jobs in agriculture, but Ukrainians, who mostly come from urban centres, seem to be unhappy with such a potentially radical change in their own professions. Some problems also remain unresolved for Ukrainian citizens, like healthcare access and pension payments. Typically, Ukrainians say they will stay in Belarus for a while to wait for the war to end, but apparently many will become Belarusian residents as the conflict's resolution appears to be complicated. Most incoming Ukrainians are asking for residency permits, which allows them to work and study in Belarus. According to Ambassador Vialička, 1,500 already have the permit, and 3,000 more are waiting for it. Belarusian media often call arriving Ukrainians refugees, but the government shuns this term, as legally they do not have refugee status. The government is considering granting refugee status only to 500 Ukrainians at the moment. In June, Aliaksandr Lukashenka publicly admitted that Belarus welcomes migrants from Ukraine. “A lot of people are willing to move to Belarus from Ukraine. We ordered the embassy to create lists of them, to accept them with due organisation. We need a labour force, and we are ready to place them in various parts of the country, provide them with shelter and jobs,” he said. The chief of the Migration and Citizenship Department of the Ministry of Home Affairs Aliaksej Biahun said that "the government seeks to avoid refugee camps or any places of dense concentration of Ukrainian migrants. They will be spread out all over the country, and we recommend to them that they visit regions which have a labour force shortage." The problem of employment becomes crucial for those who are running away from war to go to Belarus, as the Belarusian government barely provides any financial support for refuge seekers. Instead, it suggests that Ukrainians take up jobs which are unpopular among Belarusians. In the end of July the Ministry of Labour published a list of vacancies available to Ukraine citizens in Belarus “in response to numerous inquiries of Ukraine citizens regarding the employment”. The list provides vacancies in the six regions of Belarus and Minsk city, around 300 vacancies in all. These jobs usually come from the public sector and offer low wages. Most of the vacancies come from the agricultural sector, as rural areas suffer from the highest shortage in their labour force. Here, the employers usually offer a $300-400 salary, not much considering the tough conditions and working schedule. Moreover, as most migrants come from the urban centres of Ukraine, they seem even more reluctant to master collective farming. The education and healthcare sector offer prospective employee even less – $200-300 per month. Industry alone offers a more competitive salary, sitting between $400-700, but job openings remain few and far between. Ukrainians report other numerous problems after arriving in Belarus. As non-citizens, they have no access to the healthcare system, nor the educational for their children. Obtaining a work permit involves dealing with a lot of red tape, so Belarusian employers from areas not suffering acute labour force shortages prefer not to deal with Ukrainians. Another problem Ukrainians face in Belarus concerns their pensions. Belarus and Ukraine have no agreement on mutual pension payments, so Ukrainian pensioners cannot get their money here. So, for retired people it is virtually impossible to live by themselves. To address these problems, on 30 August Aliaksandr Lukashenka signed a decree which made the stay of Ukrainians in Belarus easier. It removed the residence permit fee and the fee for a health certificate, both of which are necessary for legal employment. It also simplified the employment procedures for foreigners – quite an important step, and children have received the right to a free education. Some categories of people, like families with small children, received the right to receive welfare benefits equal to that of a Belarusian citizen. However, some problems remain unresolved – for instance the migrants can have access to Belarusian health service only in the case of an emergency. The issue of pensions also remains unchanged, as it requires a more substantial legal process. Chief of UN High Commissioner for Refugees for the mission in Ukraine, Belarus and Moldova Oldrich Andrysek visited Homiel's temporary refugee centre for Ukrainians. He said the Belarusian government does a good job to helping the migrants, as it tries to resolve any problems that arise in quick order. However, it is still unclear whether or not the UN is going to address the problem of Ukrainian migrants in Belarus in any way. 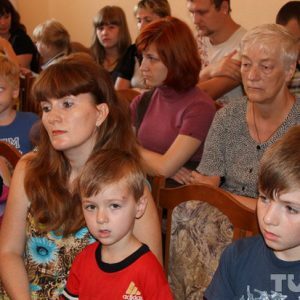 In the situation where their neighbours are in trouble, Belarusians have shown that they are actively trying to get involved in helping them. Strikingly, all sectors of society, be it the opposition, pro-government forces or the politically indifferent, have joined in on charity campaigns to help displaced Ukrainians. The Belarusian Committee for Solidarity with Ukraine appeared on the scene back in March 2014, uniting several dozen opposition politicians and intellectuals who decided to organise support for Euromaidan inside Belarus. In August the Committee launched an initiative to create a registry of vacant of accommodations from their own property holdings, which Belarusians could offer to Ukrainian refugees. Belarusians can submit such offers online, while Ukrainians can request living space there. “The people in Ukraine are forced to hide in basements, they are at risk of being killed at any minute, and there are children among them. Many of them have nowhere else to go, and we need to do everything we can to help them,” one committee announcement says. Government-backed civil associations such as Bielaja Rus and BRSM have also joined in the charity campaign. For instance, they organised a week of refugee support on 18-25 August in Rahačoŭ, which hosts about 100 families from Ukraine. The Belarusian Orthodox Church also decided to launch a charity campaign for Ukrainian refugees. It announced a collection all kinds of basic necessities at its parishes. 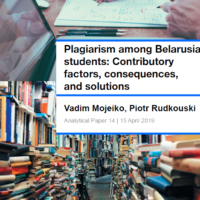 Ukrainians usually say that they came to Belarus on temporary basis in order to escape the war, but it seems that Belarus may yet become a new home for many of them. As the solution to the conflict appears to be a complicated issue, the Donbass will remain in turmoil for a long time to come. The new Ukrainian residents of Belarus will hardly save the depressed agricultural sector, but they will definitely improve on the nation's negative demographic trend.